Shown is the Berry Town Council at its Aug. 6 monthly meeting. From left: Mayor Jimmy Madison and councilmen: Wesley Jacobs, Chris Rice, Russell Madison, Troyce Townsel and Calvin Madison. 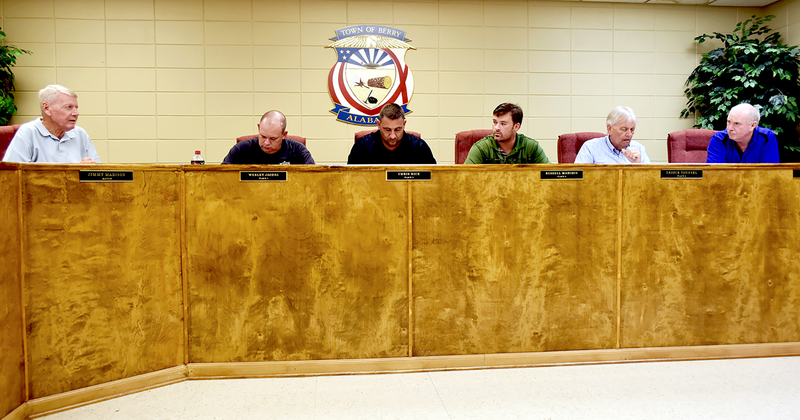 The Berry City Council held a brief regular monthly meeting on Aug. 6 at Berry Town Hall. All town councilmen were present for the meeting, in addition to Mayor Jimmy Madison and Town Clerk Marie McCluskey. Berry Police Chief Gerald DeDeaux was not present at the meeting to present the monthly police department report to the council. The only item of business on the agenda for the meeting was an appointment to the Berry Park Board to replace Shane Westbrook. Westbrook is now an employee for the Town of Berry, and as an employee, is unable to remain on the board.